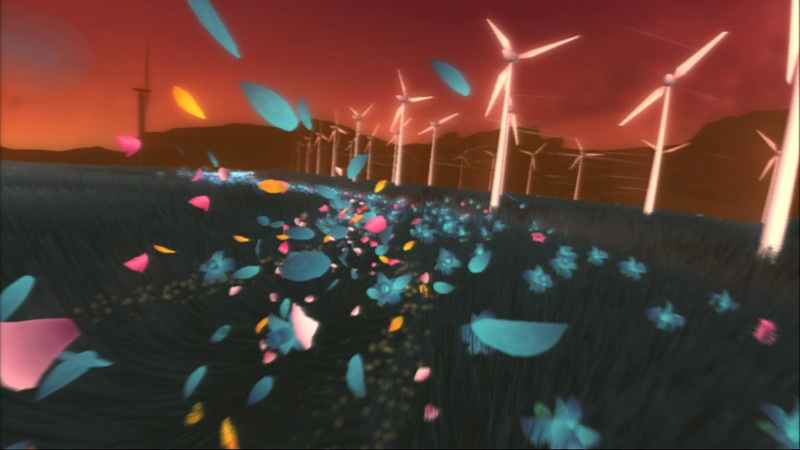 Flower™ lets you take control of the wind as you explore and navigate beautiful, lush environments using only the SIXAXIS™ motion controls. Journey through varied landscapes at your own pace, interacting with and changing the environment as you go, and find balance and harmony in your surroundings. This is an interactive escape that takes you on an emotional journey like no other game you've ever experienced. Flower is not entirely bereft of flaws. The Sixaxis motion controls may be fun to use but they lack tight precision - something that only becomes a vague issue during the fifth stage, where there are hazards to avoid. It's also possible to get stuck from time to time, forcing you to speed all over the level in an effort to find the one plant that must be touched before you can move to the next area. 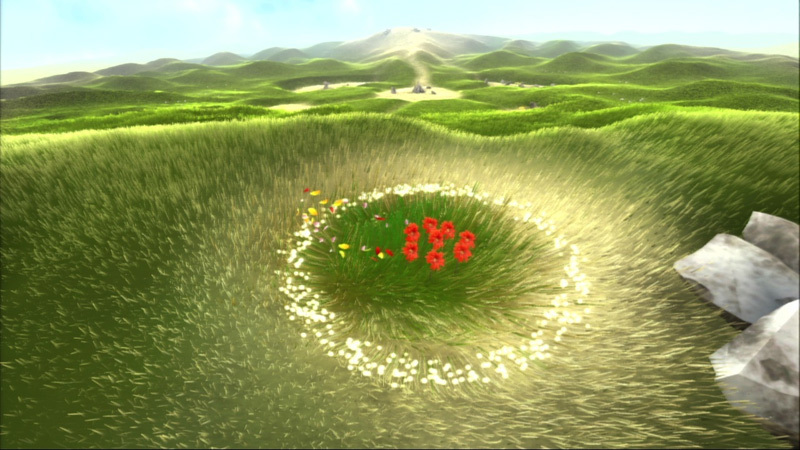 thatgamecompany's Co-founder, Jenova Chen, told me that Flower is experimenting with territory outside the traditional "fun pie," an abstract pie chart Chen constructed that maps out the emotions and motives of modern game genres. 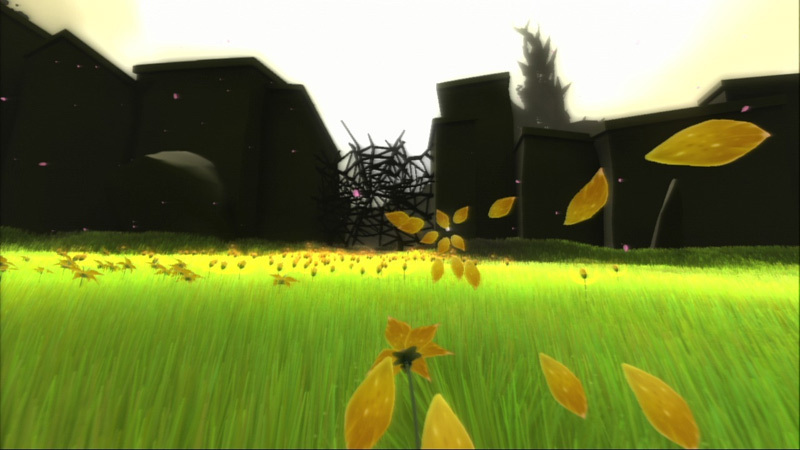 If you're interested in something very unique and very powerful, Flower is a must-play. It will especially resonate with people that possess a deep connection with nature and spirituality, as it's the type of game that reaches out to us and whispers about the beauty of life -- without saying anything at all. 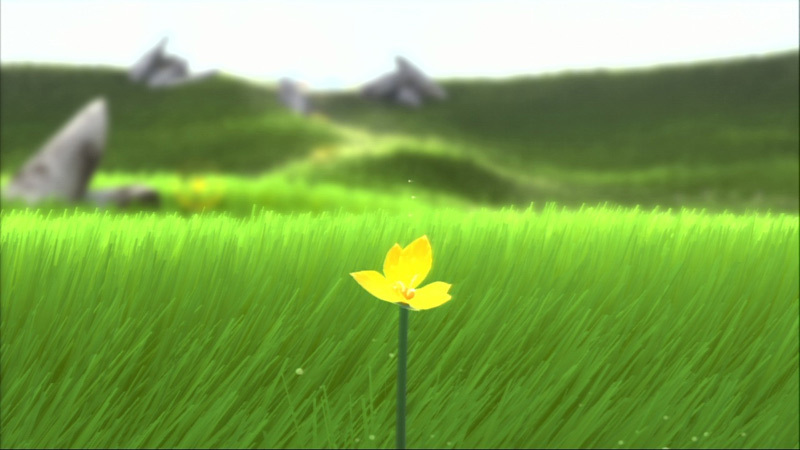 Flower is a wonderful title that isn’t hard to recommend. The gorgeous visuals, superb motion controls, and refined gameplay elements come together to create a satisfying game. There’s more underneath the surface of thatgamecompany’s polished title. If you want to be soothed, it can. If you want an awesome visual experience, it can be that. If you want to be surprised, you probably will be. Do yourself a favor and check this out. If you're looking for high-speed thrills and white-knuckled action, it should come as no great surprise that Flower is not your cup of tea. Yet its atypical approach is precisely what makes it so intriguing for those yearning for something off the beaten path. It's a short experience, with the six levels lasting a little over an hour, but it's one modestly priced release that will linger with you long after its bloom fades. You can finish Flower in a small handful of hours, but that initial experience is so densely packed with visual splendor and engaging discovery that every minute of it feels meaningful. It's not a bad way to relieve stress, either, just slumping back on the couch after a long day at the office and zooming around fields full of lush flora without a bunch of Locust or Nazis trying to score head shots on you. Flower will ultimately satisfy people who appreciate innovation more than a long-lasting experience. 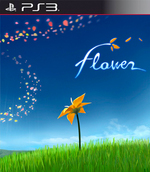 Flower is a small and focused game, especially in terms of length, but it certainly delivers a unique and relaxing experience. If you're looking for an antidote to the many sequels and franchises on the market, then Flower offers something unique and while it lasts, it's a great game in its own right. In that respect, it's similar to Electroplankton, or those Flash bubble-popping games. For people who don't get it, it'll just be another pretty but pointless bit of multimedia, and the arty aspirations won't be enough to mask the lack of substance. But if you succumb to its charms and let it meander its way into the deeper recesses of your consciousness, you'll find Flower to be full of some of the finest gaming moments known, and your life will be all the richer for playing it. It is, simply, a game where you want to see what happens next, because whatever does happen next will be delicate, beautiful and pleasurable, and never so hurried as to overburden the spectacle and sense of immersion. Even viewed warily through the haughtily lyrical prism of thatgamecompany's artistic mission statement, these are the characteristics of a well-designed videogame, and the torch-wielding art police would do well to encourage them rather than arguing about the designers' motivation. Flower is set to divide the PS3 community. Some will love it, others will hate it and others still, like me, will think it’s alright. Unless further downloadable content is planned though, it’s not a game that you’ll revisit once you’ve had your two hours worth of fun. There's no reason to go back to Flower other than to show visitors how cool the Sixaxis controller is and how well it has been implemented. 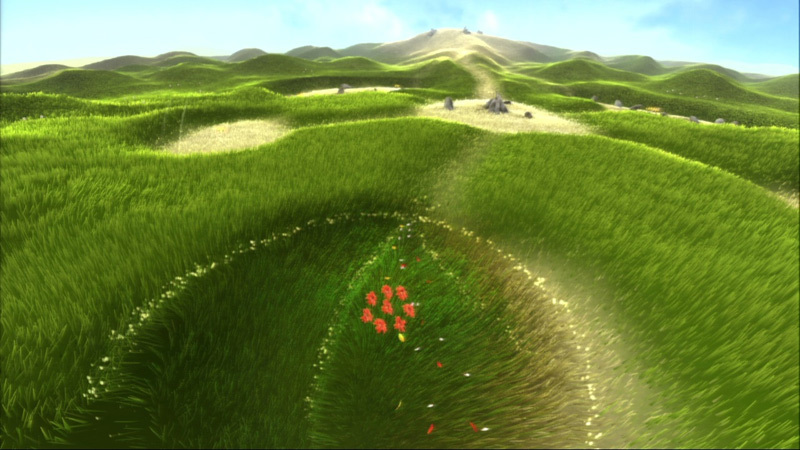 La nueva obra de Thatgamecompany sigue la estela de su anterior flOw en cuánto a concepto y puesta en escena. Se trata de un juego original que se escapa de los cánones actuales y que puede generar opiniones que se encuentren a las antípodas las unas de las otras. Flower no se puede tomar como un juego al uso, porque no lo es y tampoco lo pretende. Se trata de una experiencia audiovisual especial, armónica y relajante. El objetivo final es fluir con el viento mientras se goza del piano, de los colores y del movimiento de la naturaleza. Flower dépasse le cadre du jeu vidéo tel qu'on l'entend habituellement : il s'agit d'une expérience poétique. La console est ici utilisée comme un vecteur pour vous transmettre de fortes émotions et vous immerger dans un monde onirique. Il est certain que ce titre ne plaira pas à tout le monde, mais ceux qui aiment sortir des sentiers battus trouveront là une véritable œuvre d'art disponible à un prix modique. Vous sentez-vous prêt à plonger dans le rêve d'une fleur pour en revenir avec des étoiles dans les yeux ?